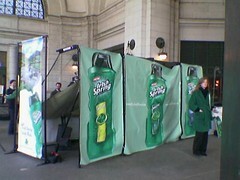 Irish Spring is giving out free samples of body wash and a Zagat booklet of Irish pubs, near the Union Station 1st St NE entrance. There also seems to be some sort of Shoot the Hoops game thingy. Timed to go with St Patrick’s Day. Nice.